I’ve got to admit that the Corn Belt of the USA was probably the last place in the world where I thought that EverGreen Agriculture could take root. I knew that the historical trajectory of bigger farms, bigger equipment, extremely simplified maize-soybeans cropping systems, and an industrial approach to farming, all present real challenges to the integration of trees in farming systems. Thus, it was exhilarating to learn that there are pioneers out there who are grappling with these challenges, envisioning fresh, new ways of addressing them, and succeeding. And that they are also writing elegantly about their experiences to guide others along the pathways to the perennialization of agriculture. Mark Shepard runs a 106-acre farm in southern Wisconsin, that he converted from a row-crop grain enterprise into a commercial-scale perennial-annual agricultural ecosystem. He started from the perspective of combining ecological theory with hard-nosed economics. 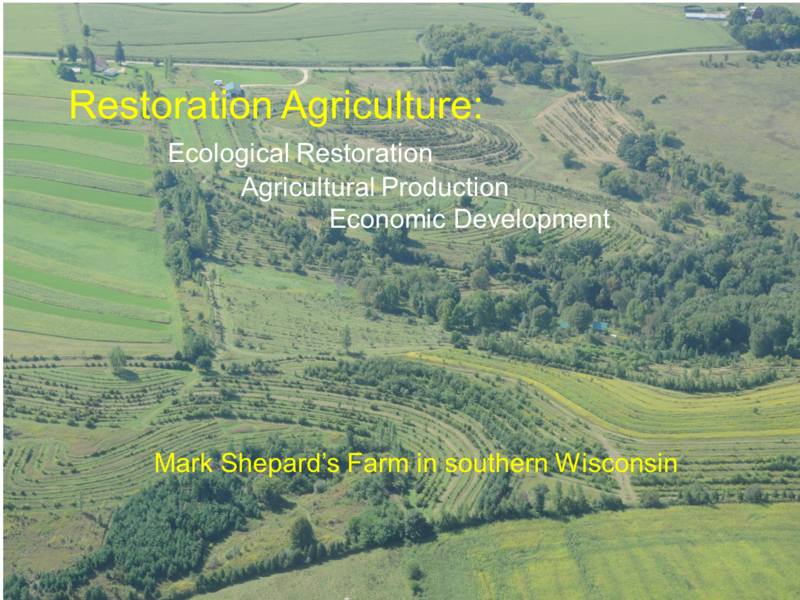 And in the process he has created a profitable farm based on the concept of developing a farmscape that mimics the original oak-savanna ecology of Richland County, Wisconsin. 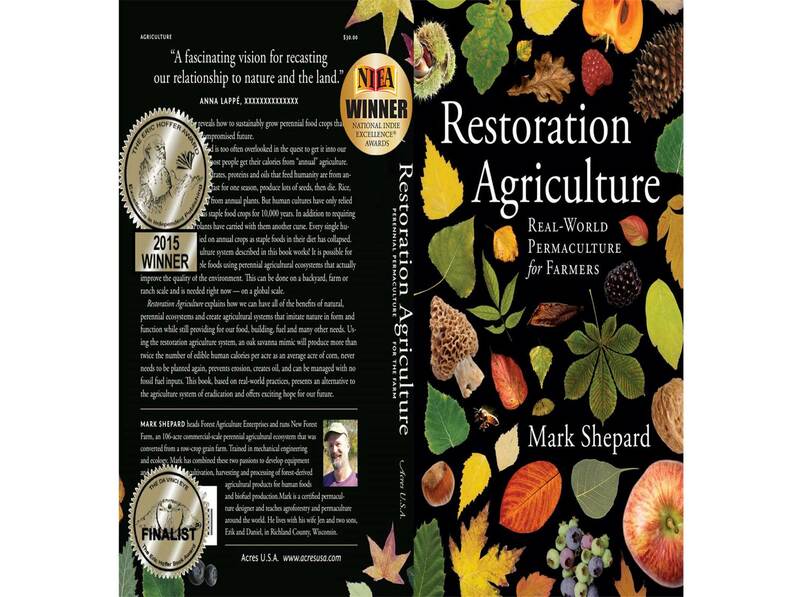 In his new book, Restoration Agriculture, Real-World Permaculture for Farmers, Mark lays out the theory and the practice. And he has made the effort to show in detail how it works, and how others can do it, too. Mark’s oak-savanna agroecosystem mimic produces a diversified range of food products that are processed and marketed through the farmer-owned 1600-member Organic Valley cooperative. 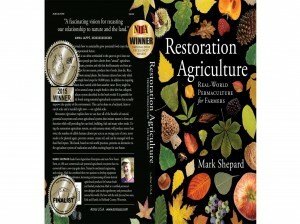 His book describes the journey, and along the way he shares invaluable tips and insights for all those that might contemplate stepping into the world of a more perennial agriculture, that makes it profitable to produce our staple foods by integrating trees and shrubs into annual crop systems. And doing so in commercial, mechanized farming systems that also dramatically improve the quality of the environment. Such a trajectory could fundamentally change the face of agriculture, and the ecological health of the entire planet. Woody crops are able to use an extra two to three months’ worth of sunlight before and after annual plants are able to do this. Their longevity is another obvious advantage. Mark discusses all the ins and outs of growing taller trees, including oaks, chestnuts, beeches, in a four-story structure with understories of woody perennial crops such as apples, hazelnuts, cherries, raspberries and blackberries, and grapes, along with ground-hugging shade-tolerant crops of mushrooms, with the more sun-loving annual crops and forages occupying the alleyways. These are integrated with various livestock enterprises right in the mix. And his restoration agriculture savanna silvo-pastoral systems produce a dappled shade where forage crops have more optimal temperature and light levels for longer periods of time throughout the year. Mark emphasizes that the perennial polyculture farmer is not striving to get the most out of any one crop. Rather, he is striving to manage and optimize an ecological system: A system modeled after nature. A system designed to optimize its total system yield. He notes that the restoration agriculture farmer is practicing an agroforestry where perennials are directly integrated with annual crops (or what we may also refer to as evergreen agriculture). He emphasizes that the difference between a USDA-approved agroforestry of simplified practices (such as windbreaks or riparian buffers) and restoration agriculture is that the latter is the practice of agroforestry on ecological steroids. Indeed. It is gratifying that serious research is now getting under way at universities throughout the Corn Belt to further evaluate and expand on Mark’s ideas. As a complement to reading the book, you will want to pull up some of Mark’s videos on YouTube for further inspiration.